(UPTOWN CHARLOTTE, NC) -- The Charlotte Knights will host a total of eight college baseball games at BB&T Ballpark in 2019 as part of the team's annual Collegiate Baseball Series. Charlotte Knights General Manager Rob Egan announced the full slate of games to season membership holders and media during the club's annual Post-Season Party at BB&T Ballpark earlier this evening. The entire series, which features the most college baseball games played in one season in BB&T Ballpark history, is headlined by the annual University of North Carolina/University of South Carolina game, two Charlotte 49ers' games, and the first-ever BB&T Ballpark appearance by Clemson University. The 2019 calendar also features the return of N.C. State University, Appalachian State University, Wake Forest University, Davidson College, Gardner-Webb University, and Winthrop University. Additionally, Queens University, which is piloted by head baseball coach Jack McDowell -- the 1993 American League Cy Young Award-winner -- will face Lenoir-Rhyne University on Friday, March 8th. 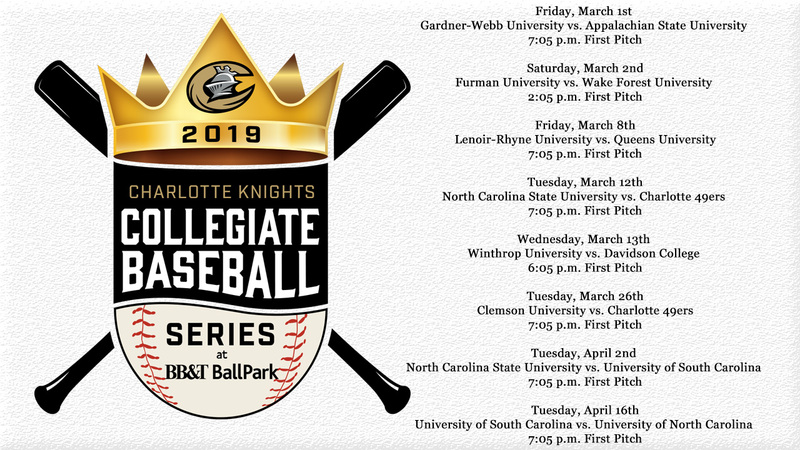 "We are very pleased to announce our 2019 college baseball schedule today," stated Charlotte Knights Chief Operating Officer Dan Rajkowski. "Our fans have come to expect exciting and competitive college baseball games at BB&T Ballpark and we're very happy to continue our longstanding relationship of hosting these games. On behalf of the entire Knights' organization, I would like to thank all of the schools, their coaches, staff members, as well as all of the fans for their commitment and support of college baseball games at BB&T Ballpark over the years."